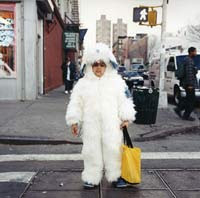 As if on cue, a little while after posting my Halloween portraits I stumbled on Amy Stein's newly updated series Halloween in Harlem. These are wonderful photographs, much better than mine. Go have a look. Great composition. Great colors. And how does she manage to convey a sense of the character even when the face is hidden behind a mask? Not easy.